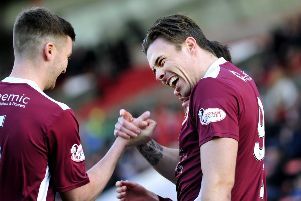 The spectre of relegation has haunted Stenhousemuir since the start of the season, but now it is looming over Peterhead too after Warriors’ recent safety bid. After a slow start, the Warriors are now on a steady improvement and moved off the bottom of the Ladbrokes SPFL League One table on Boxing Day with this win at Balmoor. Indeed while the result came as a shock to the home support it shouldn’t really register. Statistics show Stenhousemuir have the third best away form in the league based on their last six games on the road. And there’s not many longer trips for the Warriors than to Peterhead, especially on Boxing Day and especially in the eye of a storm. In a wind as ferocious as any seen at Balmoor in recent times forced by Storm Conor Stenhousemuir blew Peter head away with a late double. Willis Furtado and Rory McAllister both went close as play moved end to end in the opening exchanges, and Mark Gilhaney saw a 16th minute snapshot from the right corner of the six yard box saved at the post by Fraser Hobday. The Blue Toon almost made the perfect start to the second half, Nicky Riley with a shot saved by Colin McCabe in the opening moments. Riley had a great chance again in the 53rd minute after he was sent clear into the left side of the penalty area by Redman but he drifted too wide and his shot from an acute angle went past. That was to prove a defining moment. Out of nowhere Stenny went in front after 70 minutes. Alan Cook whipped in a corner kick from the right and the ball flicked off a head and into the far corner. It initially looked like it was the celebrating Colin McMenamin but McAllister was credited with an own goal. Nine minutes later it was game over. Another dead ball from Cook, this time a free kick 30 yards out was hit low and hard but Fraser Hobday couldn’t hold it and Jamie McCormack was on hand to net and move his side out of the relegation zone and Peterhead perilously close to it. Brown Ferguson said: “I felt we deserved the win. That’s three clean sheets in the last five games. I thought we defended well as a team and the players that came in did really well.